Today, the 10-year Treasury pays just 2.4%. Put a million bucks in T-Bills and you’re banking $24,000 per year. Barely above poverty levels! Hence the appeal of closed-end funds (CEFs), which often pay 8% or better. That’s the difference between a paltry minimum-wage income of $24,000 on a million saved or a respectable $80,000 annually. And if you’re smart about your CEF purchases, you can even buy these funds at discounts and snare some price upside to boot! The market’s fast run-up since January 1 has made cheap CEFs just a bit harder to find. And some CEFs have become so pricey that, if you hold them, you should consider selling before their premiums fall to earth. So, with the markets in flux, now is a great time to take a run through my “golden rules” of successful CEF investing. Picking CEFs is a bit more nuanced than researching regular stocks, because we’re analyzing managers, strategies and holdings versus simple businesses models. After all, for lazy investors, it’s easier to count on dividends from a tired Dividend Aristocrat like Coca-Cola (KO) than it is to determine how much China exposure the Aberdeen Asia-Pacific Income Fund (FAX) has! … Until You Add the Payouts Back! 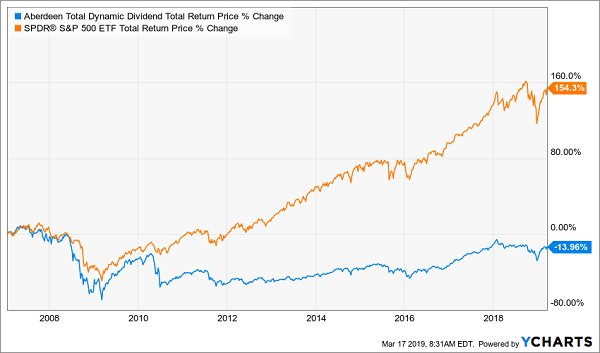 Make sure the chart you’re reading includes dividends paid (so that it reflects total returns). A fund’s history can tip you off to the quality of the management team and its strategy. GAB has one of the smartest stock pickers on the planet in Mario Gabelli, who drove it to that monster 556% return, with most of that in the form of cash payouts. Meanwhile, the Aberdeen Total Dynamic Dividend Fund (AOD) has delivered the worst of all worlds. 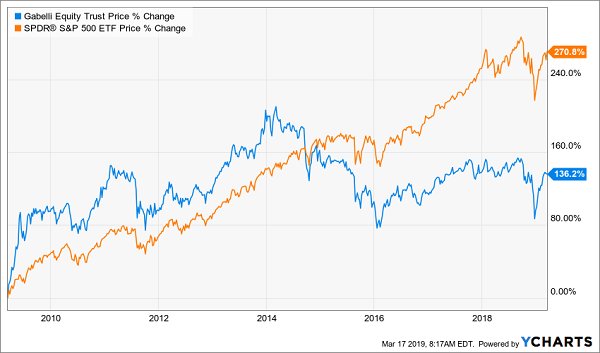 It crashed harder than the broader markets in 2008, then provided almost no rebound as stocks themselves bounced back. 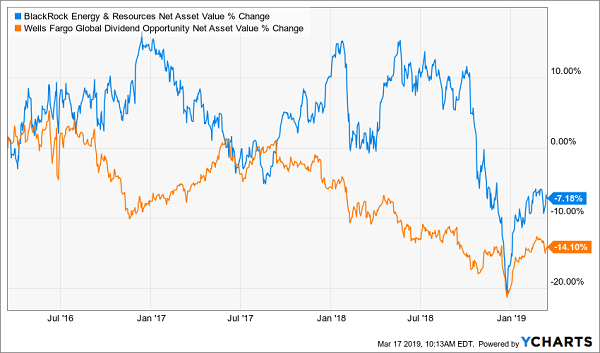 Don’t be fooled by the siren song of its fat 8.4% current yield—it’s not going to do you much good when the fund’s share price drops out from under you. Some funds pay big distributions that look great, but they’re not sustainable. However they continue to attract new (sucker) investors because they are able to fund their payouts. Too bad they’re doing it by eating into their net asset values (NAV, or the market value of their underlying portfolios)! 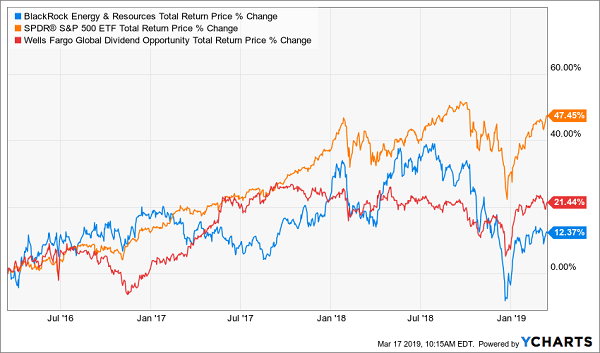 As you can see, the BlackRock Energy and Resources Trust (BGR) and the Wells Fargo Global Dividend Opportunity Fund (EOD) and have seen terrible NAV performance in the last three years. So even though both offer outsized dividends of 7.8% and 11.7% respectively, that hardly matters! 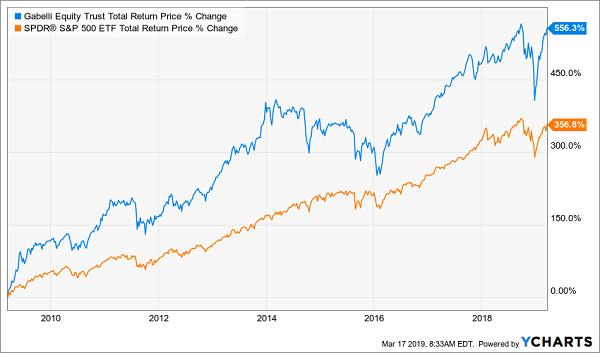 Because both funds’ weak NAVs kneecapped their total returns (with dividends included). You would have been way better off just buying SPY and being done with it! Of the three, investment income is preferable because it’s usually the most reliable. Many CEFs pay monthly distributions, so it’s best if they match up their payouts with steady income streams themselves. Capital gains from rising bond or stock prices can further boost distributions. But they are at risk of disappearing if the markets turn unfavorably. Finally, everyone assumes return of capital is bad, because it’s simply shipping your money back to you. But as we’ve written previously, it’s often good for investors. What’s more, if the fund trades at a sizeable discount, this can actually be a savvy way to kickstart the closing of a discount window. More on this shortly. Most investors are conditioned by their experience with ETFs to search out the lowest fees. This makes sense for investment vehicles that are roughly going to perform in-line with the broader market. Lowering your costs minimizes drag. Closed-ends are different, though. On the whole, there are many more dogs than gems. It’s an absolute necessity to find a great manager with a solid track record. Great managers tend to be expensive, of course, but they’re worth it. The stated yields you see quoted, by the way, are always net of fees. Your account will never be debited for the fees from any fund you own. They are simply paid by the fund itself from its NAV. One aspect of the CEF structure lends itself perfectly to contrary-minded investing: fixed pools of shares. Mutual funds issue more shares whenever they want. But CEFs have a fixed share count, with their funds trading like stocks. 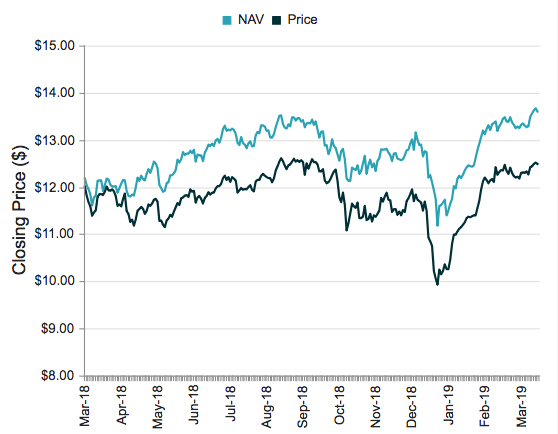 As a result, from time to time a fund will fall out of favor and find its shares trading at a discount to its NAV. This is basically free money because these underlying assets are constantly marked to market. If a fund trades at a 10% discount, management could theoretically liquidate the fund and cash out everyone at $1.10 on the dollar. Or it can buy back its own shares to close the discount window (and boost the share price). A discount is a great start, but do make sure the team at the top has a plan to close that window! It’s rare to see any fixed income manager put his or her own money on the line at all, unfortunately. According to a recent Barron’s article, nearly half of all closed-end funds have no insider ownership whatsoever. That raises an obvious question: why would we want to own any of these funds, if the managers don’t want to buy in themselves? Well that’s not exactly right. Their principal is more than 100% intact, thanks to price gains fueled by collapsing discounts, like the example I gave you in Rule #6 above! Which means principal is actually 110% intact after year 1, and so on. And I talk to management, because online research isn’t enough. I also track insider buying to make sure these guys have real skin in the game. Today I like three “blue chip” closed-end funds as best income buys. And wait ‘til you see their yields! These “slam dunk” income plays pay 6.1%, 8.6% and even 9.1% dividends. 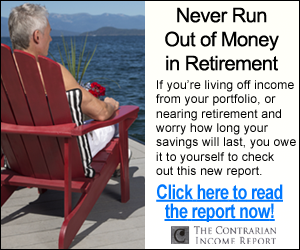 Plus, they trade at 10 to 15% discounts to NAV, which means they’re perfect for your retirement portfolio because your downside risk is minimal. Even if the market takes a tumble, these top-notch funds will simply trade flat… and we’ll still collect those fat dividends! If you’re an investor who strives to live off dividends alone, while slowly but safely increasing the value of your nest egg, these are the ideal holdings for you. 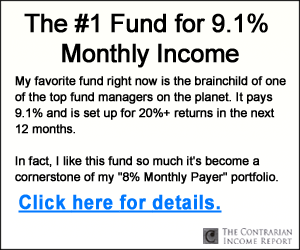 Click here and I’ll explain more about my no-withdrawal approach—plus I’ll share the names, tickers and buy prices of my 3 favorite closed-end funds for 6.1%, 8.6% and 9.1% yields.